At Energy Trust of Oregon, we strive to pursue innovative solutions for delivering cost-effective energy efficiency and clean renewable energy. One of the many ways we do this is by employing college and graduate student interns who bring a fresh perspective while they earn valuable work experience and networking opportunities. 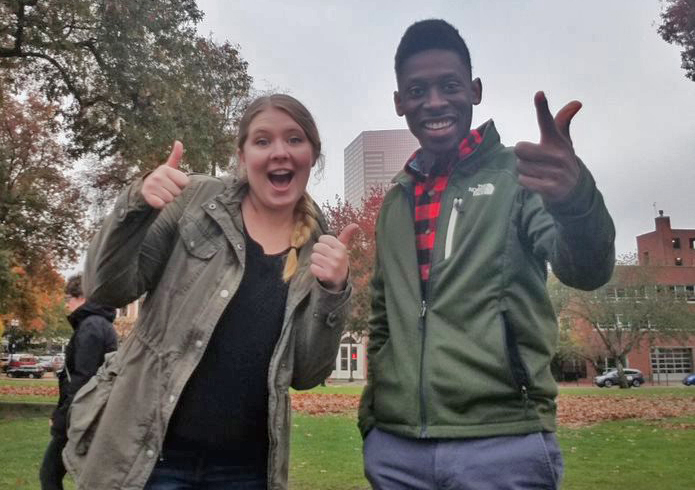 This year, Mariah Wills and Chris Crockett, both from the renewable energy engineering program at Oregon Institute of Technology, are sharing their energy and enthusiasm with our Industry and Agriculture and Renewable Energy teams. Mariah completed her bachelor’s of science in engineering in June. She is working with the technical team in our Industry and Agriculture sector to ensure everything is in order for standard projects such as lighting and irrigation upgrades. She also completes review of custom technical analysis studies and verification reports. Mariah enjoys the opportunity to visit project sites, including wastewater reclamation facilities, that are investing in efficiency improvements. She also spent a day attending our monthly Conservation Advisory Council meeting, a group comprised of interest groups and stakeholders with strong experience who help guide our work. In addition to her internship, Mariah is studying for the fundamentals of engineering exam—the first step in acquiring her Professional Engineering license. Chris Crockett —our Renewable Energy engineering intern—will graduate June 2019 and knows Mariah well. In fact, they completed their Oregon Institute of Technology capstone project together: testing the feasibility of West Linn’s city parks and community centers going net zero through energy efficiency and solar. At Energy Trust, Chris is working on wind, geothermal, biogas and hydroelectric projects. He is particularly focused on projects that support the Farmers Conservation Alliance’s Irrigation Modernization Program, which helps irrigation districts modernize their systems, save water and energy, leave more water in-stream for fish and wildlife and generate revenue-producing hydropower. Chris appreciates how much he’s able to get out into the field. “I’ve been traveling to irrigation districts where efficiency projects, such as converting open ditches to piped canals and installing energy-efficient pump stations, make a big difference in terms of energy and water savings and habitat improvements,” he said. After helping the Renewables team coordinate a tour of Farmers Irrigation District in Hood River for our Renewable Advisory Council, he met representatives from national laboratories, the U.S. Department of Energy and a variety of interest groups, which offered him a great networking opportunity. Chris is taking a course in wind power this term and hydropower next term and is looking forward to applying that knowledge to Energy Trust projects. Air Particulars – Can you improve air quality while also managing energy use? An Energy Trust expert Q&A.